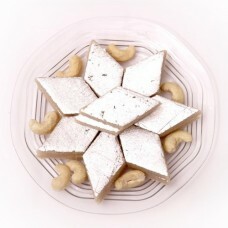 Kaju Katli made by thickening milk with sugar and other ingredients (dry fruits and mild spices). "Kesar kaju katli" is a kaju barfi recipe that includes saffron. The kesar version of this sweet dish is considered to be more exotic and rich.